Summer is the most preferred season for vacation among the majority of Indians. Children enjoy prolonged summer vacation in most states and their parents also make efforts to beat the heat by planning a vacation abroad. Solo backpackers also look for respite from the relentless heat simply by holidaying in an International destination. In essence, a foreign trip is very much on the cards during summertime for Indians from all walks of life. In this summer of 2016, if you fancy a trip overseas, you can choose from a plethora of exotic destinations. No matter where you choose to go you should carry a valid travel insurance policy along to remain financially safe from several different unexpected mishaps. Why Should You Avail Travel Insurance Plans? Most foreign countries like US, Australia has made travel insurance essential from only some specific travel insurance companies for visa processing. Being armed with a travel plan you are entitled to make claims for a list of unplanned expenses during the trip. The following risks are covered under a comprehensive travel insurance plan. If any of these unforeseen event spoils your trip you can not only get your financial losses reimbursed when you get back to India but you can also get assistance from your travel insurer to fix any issue during your trip abroad. In case, your travel schedule changes and you decide to stay in abroad for longer period of time, you can get the travel insurance policy renewal done online and extend it’s validity. How To Find The Best Travel Insurance Company in India? Now that you know why a travel cover is indispensable for a worry-free vacation, you would obviously look to deal with the best many people make the mistake of choosing travel insurer on the basis of the Sum Insured and premium of the policies on offer. Along with these two crucial parameters you need to consider many vital factors to make an informed choice of travel policy. The following are the criteria to find the provider of best travel insurance plan in India. 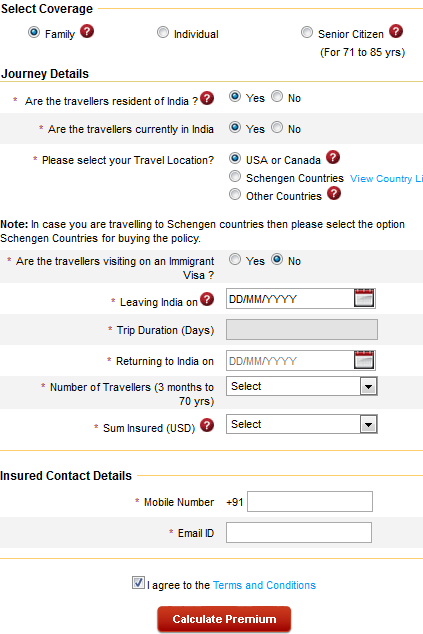 How To Calculate Travel Insurance Premium? First of all, you need to choose the category of travel policy among Individual, Family and Senior Citizen. After choosing the category you need to choose your destination and provide some basic information regarding your trip. Five plans under the Single Trip policies. Two options under Annual Multi Trip Plans. Renewable for life (For annual Multi Trip only). Reimbursement of medical expenses due to accident and sickness. Bajaj Allianz already bagged the coveted CNBC AWAAZ Travel Awards as the best Travel Insurance Company in 2010, 2011, 2014. Bajaj Allianz enjoys a robust presence in the India’s travel insurance space by virtue of its comprehensive travel policies. Here is a list of travel covers on offer at Bajaj Allianz. The Travel Asia Policy is another offering by Bajaj Allianz. This is a comprehensive travel cover that offers provide total medical cover to the international traveler. The policy comes in two variants; Travel Companion and Travel Elite. Each of these two variants comes with two sub-variants as well. These sub-variants under both Travel Companion and Travel Elite are known as Asia Flair and Asia Supreme. The below is the coverage of each category of Travel Asia Policy. HDFC ERGO HDFC ERGO has come up with an array of general insurance products that encompass Health, Motor, Travel, Personal Accident and Home in the retail space. The company received iAAA rating by ICRA for paying highest amount of claim. As far as the travel policies are concerned, HDFC ERGO offers Single Trip, Multi-Trip, Asia plan (excluding Japan), Family Floater plan and a Student Travel Insurance Plan called Student Suraksha. Explore Platinum Aside from the above-mentioned travel policies, Religare offers a plethora of optional covers under Student Explore Plan as well. Here is a complete list of these optional covers and how much they cost in each variant. Aside from the above-mentioned travel policies, Religare offers a plethora of optional covers under Student Explore Plan as well. Here is a complete list of these optional covers and how much they cost in each variant. Conclusion: Finding the right travel insurer is not an effortless job by any stretch of imagination. Your chosen travel insurance provider must have a wide network globally which is capable of providing support promptly. Most importantly, you have to ascertain that your chosen insurer is also the approved insurer of the country you are heading to. To gather more information about these top travel insurance companies and their reputation you should check news and read articles. Once you shortlist a few of them you should also be able to compare travel policies offered by them. Selection of the right travel policy is no less hazardous than selecting the right travel insurer. You need to ascertain a lot of factors before settling on any particular travel cover. You need to choose a travel policy that offers wide coverage that will safeguard you from all possible inconveniences. Before buying any particular plan you should always compare available plans. GIBL.IN, the premiere online insurance marketplace facilitates travelers like you with easy, fast and neutral comparison of all the travel insurance plans available in India. You just have to put in some basic details to get a list of travel policy quotes. You can compare plans in terms of premium and other features and buy the right travel plan right from the portal of GIBL.IN as per your needs and budget.